Where to read about the Elections in India? There is an election process going on in India, which is frequently called “the world’s largest democracy” and an “upcoming world power”. Both descriptions are quite true, so elections in such a country should be pretty important, shouldn’t they? Because of my work I have a lot of Facebook friends in India, and they frequently write about it. Mostly in English, and sometimes in their own languages—Hindi, Kannada, Malayalam and others. Even when it’s in English I hardly understand anything, however, because it is coming from people who are immersed in the India culture. It is similar with Indian English-language news sites, such as The Times of India: The language is English, but to me it feels like information overload, and there are too many words that are known to Indians, but not to me. With English-language news sites outside of India, such as CNN, BBC and The Guardian it’s the opposite: they give too little attention to this topic. I already know pretty much everything that they have to say: a huge number of people are voting, Narendra Modi from the BJP is likely to become the new prime minister and the Congress party is likely to become weaker. Russian and Hebrew sites hardly mention it at all. What’s left? Wikipedia, of course. Though far from perfect, the English Wikipedia page Indian general election, 2014 gives a good summary of the topic for people who are not Indians. It links terms that are not known to foreigners, such as “Lok Sabha” and “UPA” to their Wikipedia articles, so learning about them requires just one click. When they are mentioned in The Times of India, I have to open Wikipedia and read about them, so why not do it in Wikipedia directly? This also happens to be the first Google result for “india elections”. And if you go the page “Elections in India” in Wikipedia, a note on the top conveniently sends you directly to the page about the ongoing election process. Compare this to the Britannica website: searching it for “india elections” yields results that are hardly useful—there’s hardly anything about elections in India in general, let alone about the current one. One thing that I didn’t like is the usage of characteristic Indian words such as “lakh” and “crore”, which mean, respectively, “a hundred thousands” and “ten millions”. I replaced most of their occurrences in the article with the usual international numbers, and I think that I found a calculation mistake on the way. So while Wikipedia is, again, far from perfect, its “wisdom of the crowds” system works surprisingly well time after time. In late February 2014 I attended WikiAcademy in Kosovo. What do most people know about Kosovo? That it’s a place somewhere… um… they kinda heard about in the news some time ago. What it actually is? It’s a partially recognized country, which was in the past part of Serbia and Yugoslavia. It is mostly populated by Albanians, with small minorities of Serbs, Turks and others. The ethnic difference between Kosovo and the rest of Serbia caused many tensions. In the 1990s and 2000s the area experienced a lot of violence. NATO and much of Europe supported Kosovo’s independence, Serbia and Russia objected, and after the Kosovo war the region emerged as a de-facto independent state. Some countries recognized it and some didn’t. Sadly, as it happens very often, what most people hear about such places is a lot of news about violence and very little stories about anything else—history, culture, architecture, language, music. I definitely care a lot about these positive things, and not much about the wars. I flew via Istanbul, and the lady at the boarding didn’t quite know what to do with my passport: she looked for a visa and when she couldn’t find one, she just asked me whether I need one. I said that I didn’t and she let me on the plane. The passport control guy on arrival also didn’t know whether Israelis need a visa and had to check a table. I guess that not many Israelis come there, which is a shame, really. Right from the airport my hosts took me to a different event: a BarCamp in Prizren. 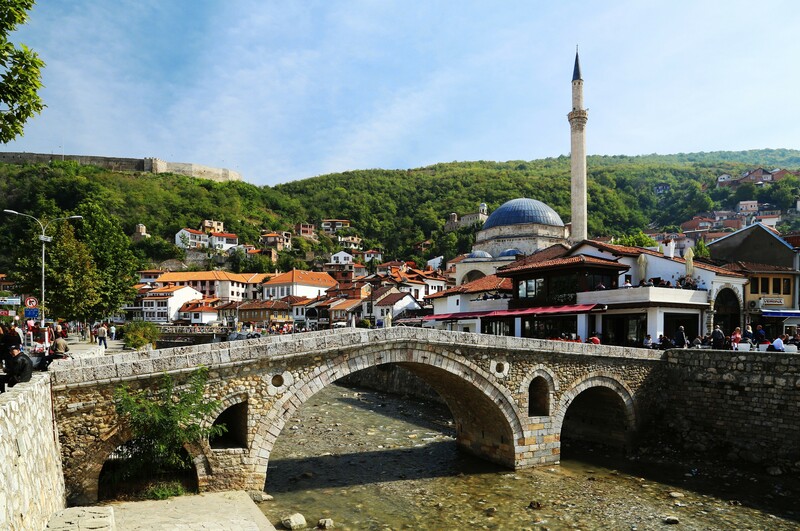 Prizren is absolutely beautiful. The Byrek—what we call “Burekas” in Israel—is delicious, the beer is fantastic, the streets are beautiful and the buildings are magnificent. Magnificent not like in France, but like in… Kosovo. In the Balkans. Down to Earth and human. In the BarCamp there were three talks: two in Albanian, which I sadly don’t know, about… some Open Source projects. The third one was mine, about that-website-that-we-all-know-and-love. I used just one “slide”—xkcd’s famous protester, which, to my surprise, a lot of people in the audience didn’t recognize. I invited people to contribute, of course, and I enjoyed answering a question about how concepts such as “love” can be referenced and fact-checked. The bar is which the event was held is called “Hobbiton”, which is appropriately adorned with multiple Tolkien-themed posters. The Albanian Wikipedia, however, didn’t have an article about Hobbits, which I mentioned in my talk, with hope that it would be written. Was it? Stay tuned. My second and third day in Kosovo were dedicated to WikiAcademy itself—first in the town of Gjakova and then in the capital, Prishtina. So what is the WikiAcademy in Kosovo? It’s an event organized by IPKO Foundation, a local organization that promotes modern telecommunications in Kosovo. This event is different from what we call “WikiAcademy” in Israel, which is more like an academic conference with talks—in Kosovo it’s more like a Wikipedia editing workshop for newcomers, but a very large one. 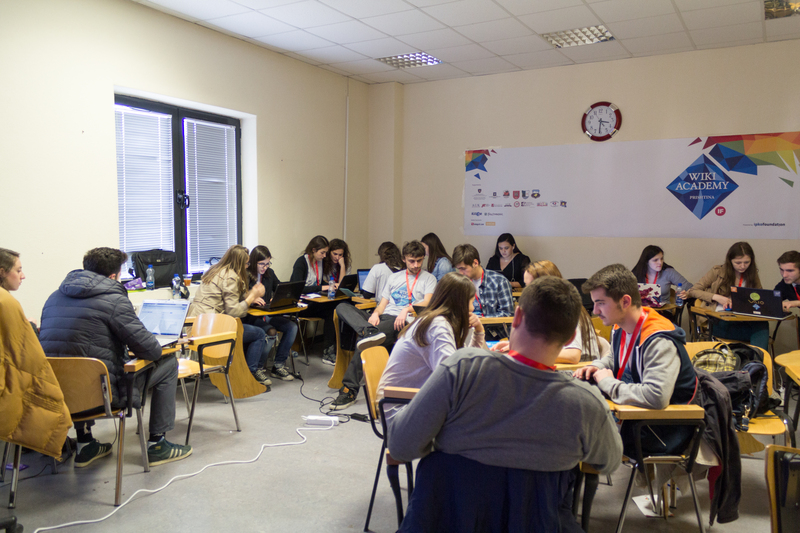 The 2014 edition of WikiAcademy is the second edition of this event, and it was held over three weekends in two cities—Gjakova and the capital Prishtina, with participants from several more cities. Over two hundred people participated. The organizers, some of whom are experienced Wikipedians themselves, prepared the event very well. The logistics were great—working wifi, tasty food and comfortable transportation—but more importantly, the participants were very well-prepared for their task of writing Wikipedia articles: they received clear topics and instructions about writing with correct encyclopedic style and citing sources. The articles were written in the English Wikipedia. The topics of the articles were all about cities of Kosovo: their architecture and monuments, education, events, festivals, culture, history and nature. Most people probably never heard about cities with unusual names such as Peja (a.k.a. Peć), Ferizaj (a.k.a. Uroševac) and Štrpce and well, now they are not just mentioned in the English Wikipedia by name, but there are several detailed articles about different topics related to each of them. I’ll reiterate this: It was fantastic to see people sitting with reference books and encyclopedias to be able to cite sources. So often this is the biggest challenge in Wikipedia editing workshops, and the organizers prepared the participants very well. It was also great that everybody knew which articles are they working on. My role was to give three talks, about Wikipedia’s encyclopedic writing style, about good practices for talk pages, and about translating articles, and other than that—to help people write, cite sources correctly, insert images, and make sure that they don’t violate any policies. It was challenging and tiring, but oh so fun. Hackathons and Wikipedia meet-ups are possibly the only kinds of events where I’m continuously so energized and talkative. WikiAcademy Prishtina. Katie Chan, CC-BY-SA 4.0. I also did my best to showcase Wikimedia’s newest software: VisualEditor, which the newbies just loved, and the Content Translation prototype. During my talk about translation, I created, as a demo, two articles in Albanian: Hobbit (as promised above! ), and Haifa, the city that hosted Wikimania 2011. After I came back, the event continued. I was one of the judges that chose the best articles and photos for awarding prizes. The big winner was the well-deserving Historical monuments in Prishtina, although many others were wonderful: Flaka e Janarit, Rugova Mountains, Health Care in Kosovo, Water in Prishtina. The awards ceremony was held a few days after that. There was also a bit of a dark side to the contest: Because most of the writers were newbies, and none were English speakers, there were many little innocent mistakes in spelling, referencing and writing style, which the English Wikipedia editors took very seriously. Some articles were even proposed for deletion, although all (or almost all) were kept. This, again, raises the well-known dilemma—it’s important to keep Wikipedia’s standards high, but it’s just as important to remain nice in the process and not “bite the newcomers”. My thanks go out to the excellent organizers: Arianit Dobroshi, Gent Thaçi, Abetare Gojani, Rineta Hoxha, Altin Ukshini, Lis Balaj and many others. I enjoyed every minute, and learned a lot. This post mostly uses Albanian spellings of place names. I do that simply because that’s what I saw during my visit. Don’t consider this post authoritative with regards to the preferred English spellings. Wikipedia may use different spellings, and they are not so consistent.